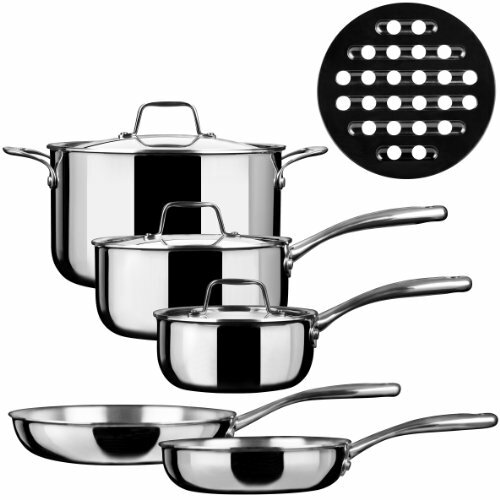 Duxtop Whole Clad Tri ply Stainless Steel Premium Cookware features three layer bounded construction, with one layer of thick aluminum core sandwiched between stainless steel layers. The whole clad structure eliminates hot spots and ensures even heating across the bottoms of pots and pans and all the way up the sides. The exclusive Whole Clad bonding technology extend cookware lifetime dramatically comparing to encapsulated base construction. This professional cookware is suitable for induction, gas, electric, and halogen cooktops. Other standard features that you can find in this Duxtop premium cookware: drip-free pouring rims; Stay-cool stainless-steel perfect-grip handle riveted to the pan; Stainless-steel lid with loop handle helps keep in heat and moisture. The stainless steel cookware is oven-safe to 550 degrees F; Freezer-safe for food storage; Dishwasher safe although hand washing is suggested. Lifetime limited warranty against manufacture defects. If you have any questions about this product by Duxtop, contact us by completing and submitting the form below. If you are looking for a specif part number, please include it with your message.